Ten minutes up the road from Harrogate, perched on a limestone ridge above the Nidd Gorge, the ancient town of Knaresborough is a picture perfect market town with a vibrant heart. This is the lush, fertile Vale of York, once an ancient passageway used by the Romans which provided limestone for some of this area's most distinguished buildings - including York Minster. 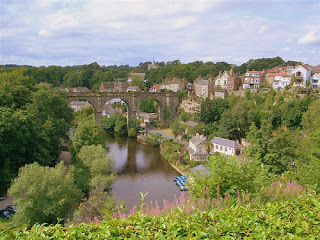 Occupying a commanding position 120 feet above the gorge are the ruins of Knaresborough's Norman castle, which offer some of the most scenic views across the town towards the impressive railway viaduct which spans the River Nidd. I arrived in the beautiful market town just as the balloons and bunting were going up for the annual Knaresborough FEVA - a colourful festival of entertainment and visual arts. Now in its 8th year, the festival will be reaching its climax this weekend with free entry into the castle and museum, a free guided walk through the Nidd Gorge (Sunday 10am) and a classical evening concert in St John's Church. For those whose visits don't coincide with the festival, there's still plenty to explore. 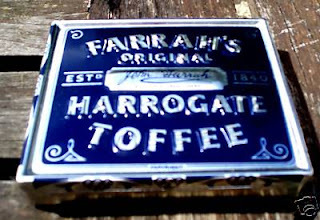 When, or if, you finally tire of the views across the gorge, wandering around the town's pretty streets, you will undoubtedly stumble upon the oldest chemist shop in England which is now the home of Farrah's famous Harrogate toffees. The chemist shop dispensed its medicinal wares in around 1720 but these days the shop is more famous for its sticky treats and vast array of Farrah's toffee tins. You can also explore the cavernous birthplace (and its picturesque riverside surroundings) of Knaresborough's most legendary resident, Ursula Southeil. Better known as Mother Shipton, England's most famous prophetess, she lived during the reign of Henry VIII and is said to have accurately foretold the Great Fire of London and the events surrounding the defeat of the Spanish Armada. She also predicted the end of the world in 1881 - but two out of three ain't bad, as they say.